There are lots of naysayers and doomsdayers out there. And they will, with utmost confidence, tell you a financial market crisis is not just inevitable … but imminent. So, thankfully, I don’t have to take that line. Fast-approaching is the Federal Reserve’s March FOMC meeting. The market, according to Fed Funds futures, is betting the Fed will almost definitely hike rates this week. In fact, they put the odds at 90% that we’ll hear about a rate hike when the meeting concludes on Wednesday. First, remember when a rate hike was a bad thing for the market? Indeed, rising rates used to mean headwinds for risk appetite. If the market believed for a second that Fed accommodation was in jeopardy of even just slowing down, risk appetite took a nosedive. Lately, rather, the market is rising along with the expectations for a rate hike. For starters, the Fed’s intervention was pitched (and generally received) as necessary for financial stability and economic growth. As to the latter, I think investors have pretty much called that bluff. Most realize the Fed’s monetary policy has little direct impact on growth. As for financial stability, well, it seems we’re far enough removed from the 2008 crisis that investors forget its advent and severity. Most ignore the fact that the financial system remains tightly coupled with asset markets and economies. And most don’t remember how quickly those dominoes can fall. Related story: It’s 10 Years Gone for the Financial Crisis … Remember that? Second, what is the real likelihood of interest-rate normalization? In two days, we may indeed see the Fed announce a rate hike. But what it will mean in the grand scheme of monetary policy might surprise you. That is because policy has been tightening far more than the mere two rate hikes in the last two years is leading on. From here I recommend some very consequential analysis from the Gavekal Capital blog. Gavekal points out the coming debt-ceiling problem. That is, the U.S. debt ceiling comes back into play the day after this week’s FOMC announcement. If you remember, in 2015, the debt ceiling was suspended. Not surprisingly, federal debt went … UP … while our fiduciary checks and balances were turning a blind eye. Cheers! Behind the scenes, though, preparations are being made for managing the debt ceiling. Which will inevitably be maxed out in no time at all once the suspension is lifted. 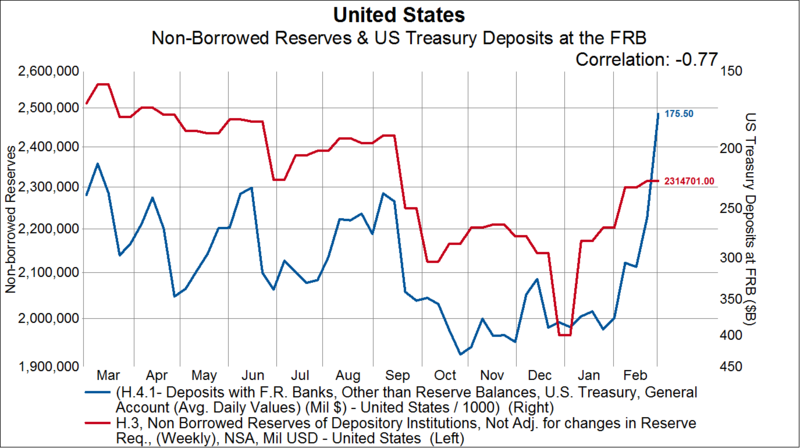 These preparations include a huge plunge in the U.S. Treasury’s deposits held at the Fed. Those deposits leaving the Fed have resulted in a rush of liquidity onto the markets. It’s manifested most obviously as an increase in commercial bank reserves. For the sake of keeping your attention, I’m going to skip over a lot of the nerdy details. So, let’s jump to the following chart that shows the similarity between rising commercial bank reserves and the interest rate on 10-year Treasuries. That is to say, when reserves go up … so do rates, and vice versa. Since last year, we’ve watched rates go up and commercial reserves do the same. These are past correlations that we should monitor. Then a withdrawal of liquidity (commercial bank reserves) might mean the growth and/or reflation trade is jeopardized. And those expectations drive interest rates down. The question is: What would generate a withdrawal of liquidity? 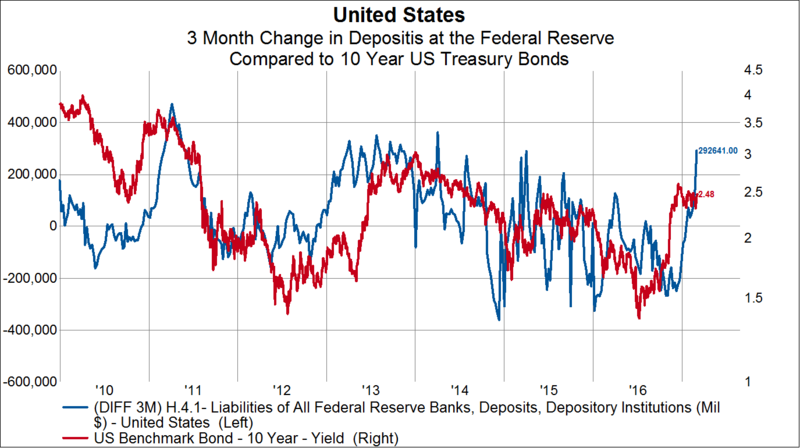 If we look at the Gavekal analysis in reverse, it would mean that new issuance of U.S. Treasuries deposited at the Fed would pull from commercial bank reserves. And why would the Treasury issue more bonds and park them at the Fed? Because the Treasury might look to borrow more to extend federal spending and support economic activity. And does that not just bring us back to a conversation about debt? Because it’s not just federal debt that’s a burden hanging over potential growth and the impact of stimulus efforts. If the Fed keeps tightening policy through interest-rate increases, can the market and economy withstand its added strain on growth potential? But what’s been dubbed by Fed board members as “surprisingly strong economic growth” is surprisingly not that strong. The recent OECD economic growth forecast is concerned that global growth sufficiency is going to be at the mercy of fiscal programs. Perhaps most notably the infrastructure and tax policy proposed in the U.S.
Is this general sluggishness — sub-3% — is a result of too much debt getting in the way. A major item factoring into the OECD’s concerns is trade. “Protectionism” is the obvious buzzword. And recent numbers show that the U.S. trade deficit widened its largest in five years. At the same time, German Finance Minister Wolfgang Schäuble is boasting about Germany’s trade surplus. He’s defying anyone who insinuates it’s something that Germany should seek to rectify. All this is to say not much is changing in the global economy. So, I’m not sure how resilient growth can be when debt and spending is business as usual. Be careful out there. Let your faith be bigger than your fear. But don’t be surprised if Wednesday’s FOMC announcement turns into a “sell the news” event because interest-rate-hike expectations have gotten ahead of growth potential.